Come for the most accessible volcano in the Mediterranean, stay for the great swimming, stunning views and artistic flair of this island. 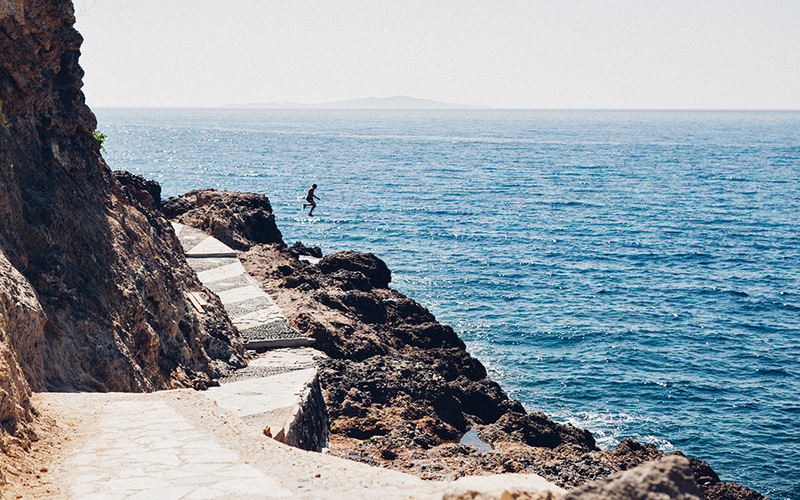 Nisyros is not your typical Greek island. This small land mass in the Aegean is also an active volcano. It is the youngest along a rift in the Southern Aegean and has experienced at least three major eruptions in the past 45,000 years. One of these, around 16,000 years ago, was particularly destructive, blanketing a wide area with volcanic ash. Over the past 130 years the volcano has been ‘dozing’, although researchers monitor its daily coughs and grumbles closely. 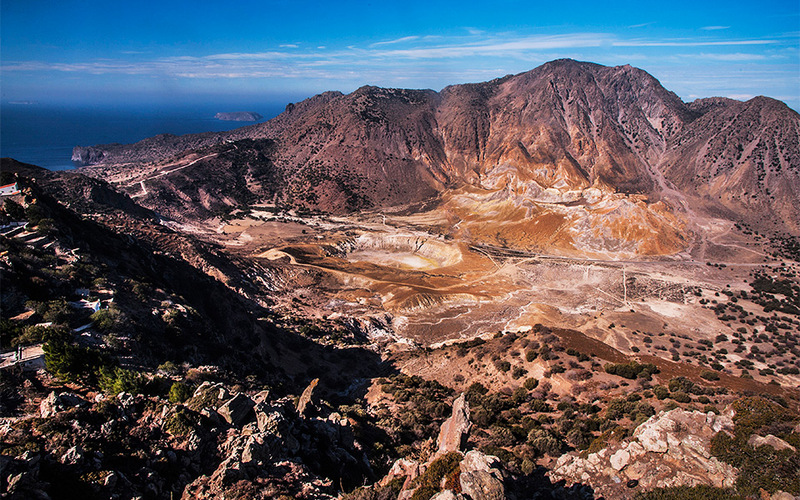 Nisyros’s volcano is one of the few anywhere in the world that can be easily visited. Anyone can make the short drive to the site and then spend hours wandering around the 10 hydrothermal craters with their wonderful names: Stefanos, Polyvotis, Alexandros. 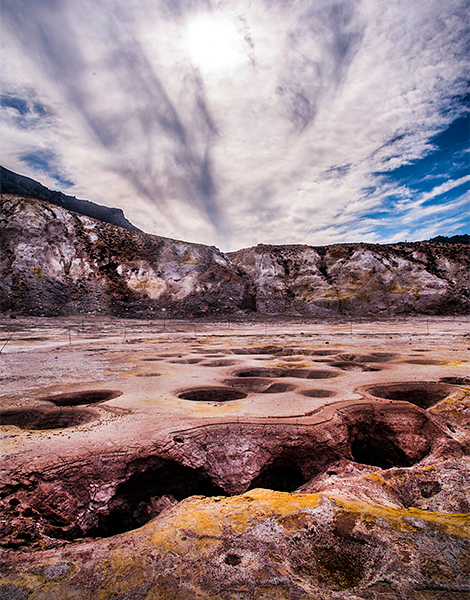 This other-worldly landscape has the potential to make Nisyros a world-famous destination – (provided, of course, the volcano remains relatively quiet). Where else can one so easily get such an intimate sense of the geological forces that shape the planet? And then combine that experience with an afternoon swim? Lovers of thumping beach bars and cocktails delivered right to their sun-loungers are probably best off opting for another island, as you won’t find any of these on Nisyros. But if you like your beaches just as nature sculpted them, then this is the island for you. Just make sure to take your own umbrella and water to avoid being caught out. Pachia Ammos is a favorite among nudists and free-campers and therefore the beach of choice for the more ‘free spirited’. There is however plenty of space for all, as the beach is enormous and the 15 minute walk from the nearest parking spot means that only the more dedicated make it here. As for ourselves you will find us a little further away at Liès, away from the crowds. 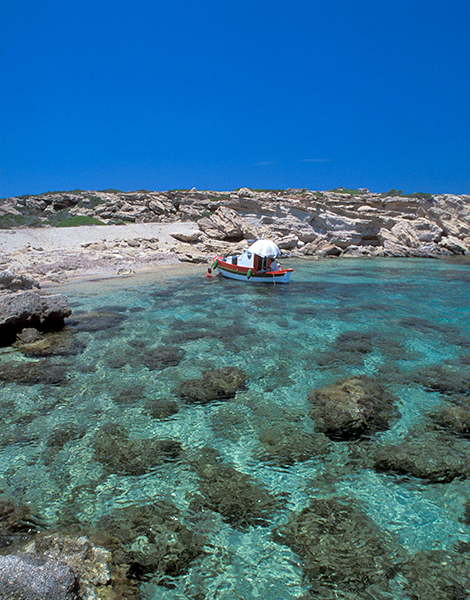 Or at Hohlakoi with its large, round stones only a short walk from the port of Mandraki. If you make it earlier enough you can even find a spot of shade under the tamarisk trees to avoid roasting in the sun. 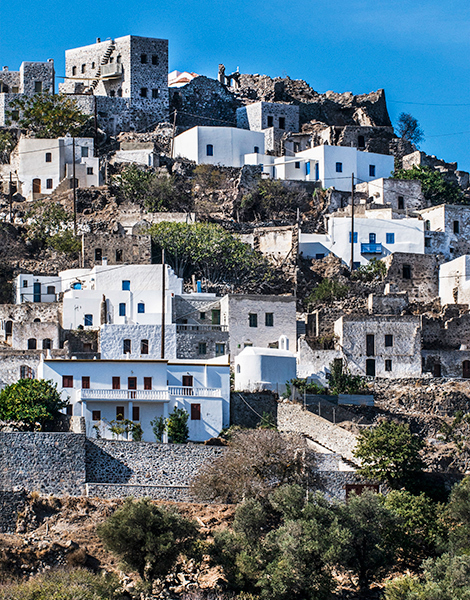 The mountain village of Emporio was abandoned following the earthquake of 1933 but has gradually returned to life as many of the traditional homes have been renovated by new owners or converted into guest-houses. Many visit the village for its two exceptional tavernas and for the ‘natural sauna’ that exists in a small cave at the village’s entrance. Invisible from the sea and located atop the natural walls of the caldera, the village thrived during the age of pirates. On the opposing cliffs, Nikia welcomes you with is picturesque and oft-photographed square (known as Porta), incredible view over the craters and well-put-together Volcanology Museum. Our excursion ends at Avlaki, the onetime pirate anchorage which is no longer inhabited. In the little bay we enjoy the best swim of the summer. Sea and rainwater mix in upper levels of Nisyro’s groundwater and are heated by geothermal activity meaning that the island offers respite to those suffering from musculoskeletal and other afflictions. Hot water springs are found at many places on the island – as well as in the sea – where the water can reach a scalding 60 degrees Celsius. But at the Municipal Baths (tel. 22420-31284) which were founded in the early 19th century and are constantly being upgraded, one is probably more likely to see young hipsters as infirm pensioners. The cafe located on the ground floor serves good food and fiery tsipouro, and the rooms at the municipal guesthouse are cheap and clean. Once upon a time a casino used to operate here as well as a theater and a library. Recently plans were announced for a major redevelopment of the baths and the creation of a 5-star hotel via a private-public partnership. Romantzo (Mandraki, tel. +30 22420.31340). A pretty stone building close to the port and capital with sea views from every room. From 35 euros. Melanopetra (Emporeios, tel. +30 6978060289). Built on the edge of the caldera in Emporio, this stunning villa with a view of the Aegean consists of 2 independent apartments that can host a total of 4-6 people. From 90 euros per apartment. Maria Eliza (Nikia, tel. +30 6944576004). A welcoming traditional home that has been converted into a guesthouse with two bedrooms on two floors located in a village with few other options for accommodation. 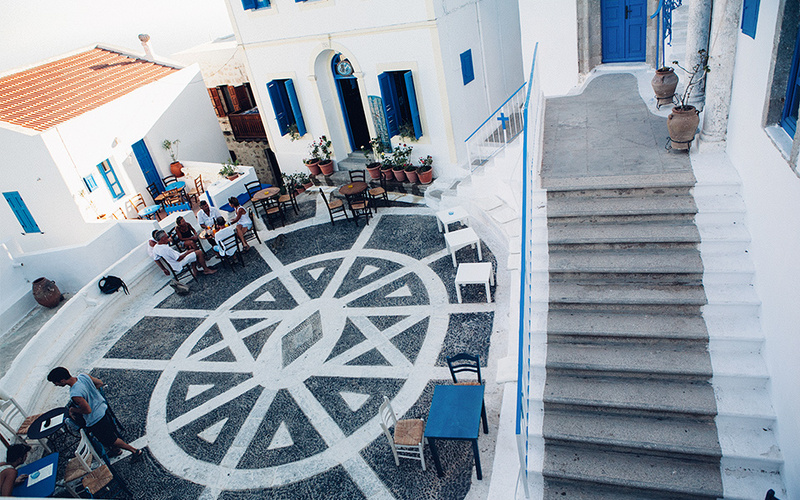 The unique energy of Nisyros that seems to spring from the geothermal vents and otherworldly landscapes has inspired many a creator and in the summer months Nisyros becomes an ‘island of the arts’. In 2016, fifteen Greek musicians improvised for 10 hours and 34 minutes inside the caldera on the night of the August full moon, and the film The Angel and the Weightlifter by director Eleni Alexandraki was filmed entirely in the crater known as Stefanos. Alexandraki has also organized, together with sculptor Jason Karaïndros, a film and arts festival on the island for the past two decades featuring screenings and seminars. 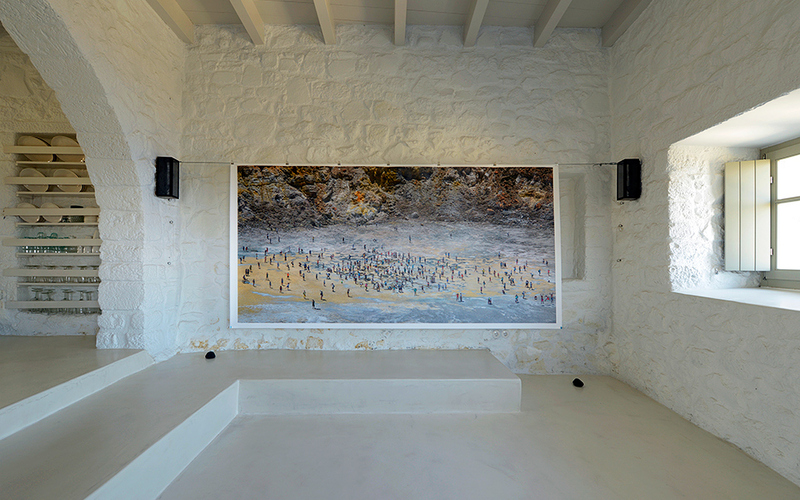 Meanwhile located within the medieval Pantoniki castle of Emporio you will find the interdisciplinary non-profit organization Sterna, founded in 2014 by artist Greg Haji Joannides to ‘foster and nurture the creative expression of artists’. 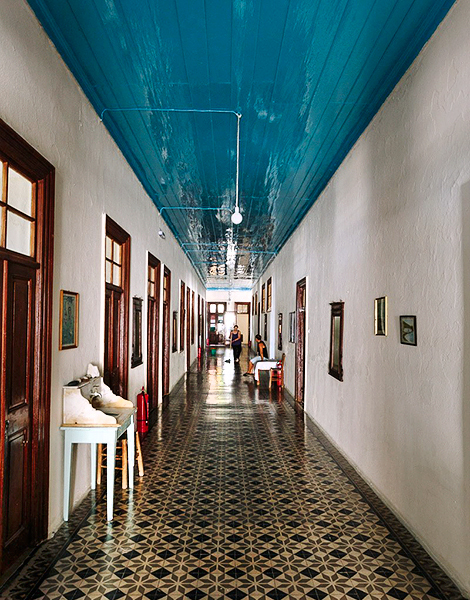 Among its activities, every year the organization hosts an art exhibition throughout the month of August featuring the works of dozens of Greek and foreign artists. Built into the rock and caves inside the old Venetian castle, the monastery of Panagia Spiliani looms over the capital Mandraki and its population of 700 permanent residents, appearing at night to hover in empty space. It is considered one of the most important Greek Orthodox monasteries and attracts pilgrims from all over the country. The celebrations of the 15th of August (marking the Assumption of the Virgin Mary) take place over a two-day period and feature religious services and a traditional feast. Among the particular customs observed here is the ‘dance of the cup’ during which the lead dancer holds a cup for donations to the monastery and to the island. Over the holiday you will also found large quantities of revithada, or cooked chick peas served in Mandraki’s main square. On the other end of the island in Avlaki is a small church dedicated to Aghios Panteleimonas which celebrates the saint’s feast day on July 27 with traditional music and dancing. 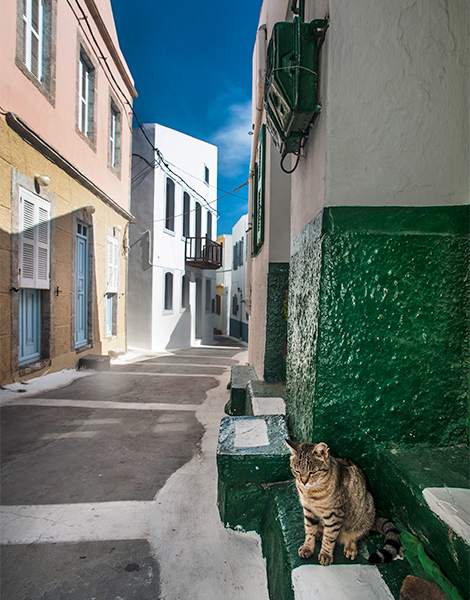 Nisyros is not a poor island. Whoever visits during the peak period around the 15th of August will meet entire families who speak broken, or even no Greek, but continue to faithfully honor Nisyran traditions over the holiday period. These are the brooklides (derived from the word ‘Brooklyn’ – the first home for many immigrant families) who return every summer from the US for a vacation on their mother island. Many infrastructure and preservation works have been funded with dollars from emigrants from the island. Among the most prominent is 69-year-old John Catsimatidis, the prominent Greek-American businessman said to be worth 3.4 billion dollars who counts both Donald Trump and the Clintons among his friends. The Balcony of Emporio (Emporio, tel. +30 2240.31607). It’s worth waiting for a table at the edge of the veranda, and make sure to get there before it gets dark so you can see the volcano. Traditional cooking and grilled meat. Aphrodite (Pali, tel. +30 22420.31560). All agreed that this is the best of the 4-5 fish restaurants that co-exist in the popular harbor. The batter-fried shrimp are strongly recommended. Eirini (Mandraki, tel. +30 22420.31365). The best of the tavernas under the trees in Ilikiomeni Square with home-style food and local specialities, such as boukounies (pork cooked in wine and rosemary), rabbit stew and incredible desserts. Bacareto Margarita (Mandraki, tel. +30 22420.31832). An Italian trattoria next to the bars of ‘Little Venice’. The ever-present Italian owner guarantees the quality of the food and… a touch of madness. The menu features Greek dishes with Italian twists. 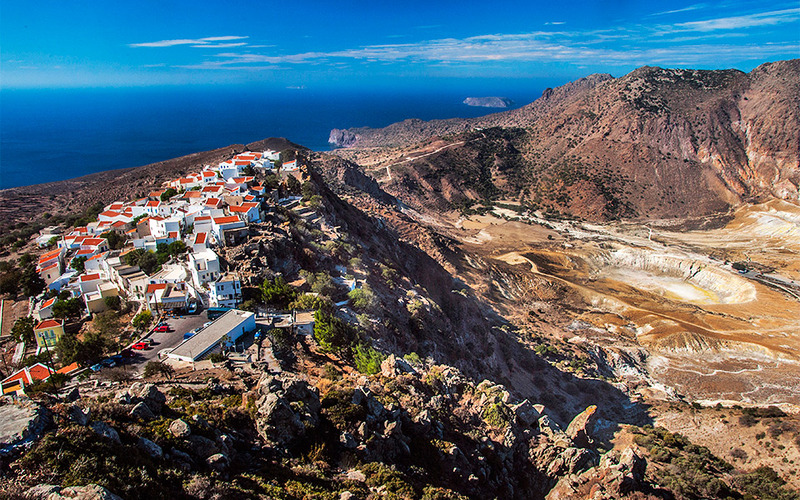 Nisyros boasts over 40 hiking trails meaning avid hikers will be more than satisfied. Most are easy trails accessible to beginners as well, although the majority end at Lakki – that is in the crater of the volcano. Some pass through Paleokastro, a fort dating to the Classical Period featuring enormous cyclopean stones so large that one wonders how they were lifted and set into place in a time before machines. 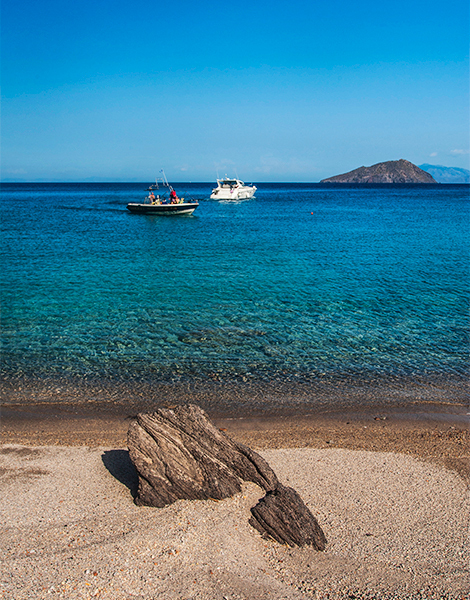 The most popular boat trip for swimming and exploring is to the volcanic islet of Giali where pumice is mined. Here traces of a prehistoric settlement have been found as well as an ancient cemetery. The islet also played a role in Greece’s war for independence, sheltering Greek naval forces. The focal point of nightlife on Nisyros is ‘Mikri Venetia’ or ‘Little Venice’ in Mandraki under the shadow of the monastery with its 4-5 very respectable cafe bars which don’t close until late at night, only to open a few hours later for breakfast. In Enallax we heard Radiohead, in Liotridia contemporary Greek folk rock and in Proveza good jazz. Elsewhere you will also find Greek pop but we sought to avoid this. Our focus was not, in any case the music or having a wild night, but the little table on the waterfront with the illuminated monastery ‘hanging’ over our heads. Of course when the wind picked up the more exposed of us got soaked. On the way back to our rooms we stopped at a bakery for fresh bread and cheese pies. You will find the bakery easily enough – just follow your nose! In front of an attractive house in Nikia, a red bandana hangs on the door – a trademark of the late Papazoglou. This was the summer home of the Thessaloniki-born legendary sing-songwriter, who would spend weeks at a time on the island writing songs, drinking tsipouro and frequenting Andriko’s cafe Varda Stenahoria in Mandraki. Papazoglou died in April 2011 at the age of 63. His home in Nikia has stayed in the family and the red bandana on the door resembles a candle-flame lit in his memory. Kafeneio tou Nikola (Nikia, tel. 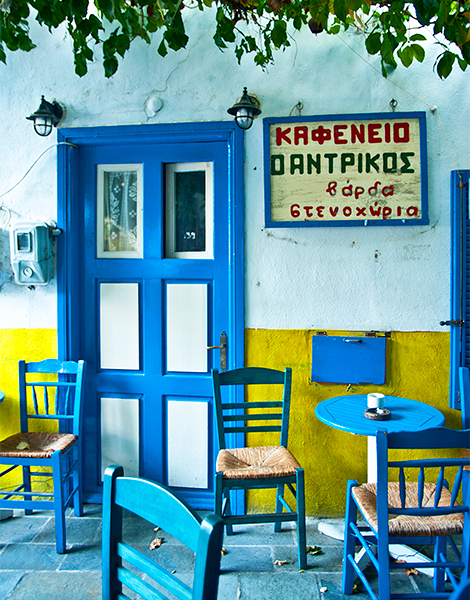 +30 6972640401) A cafe and meze bar in Nikia’s main square. You are likely to stay for hours, especially if you head there in the afternoon. Inside there is also a corner dedicated to Nikos Papazoglou. Enallax (Mandraki, tel. 22420 31760) An elegant bar next to the sea. Features good contemporary music and the odd live event under the monastery that is lit up at night. Andrikos – Varda Stenahoria (Mandraki, tel. +30 22420 31512. 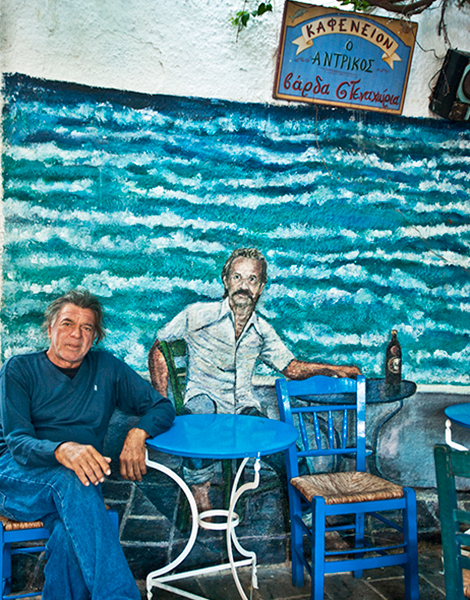 The onetime hangout of Nikos Papazoglou is frequented by patrons who all appear to have been raised on the legendary singer-songwriter’s music and is run by an eccentric and ever-present figure. Locally distilled raki (koukouzina) flows freely. Aposperi (Emporio, tel. +30 22420.31022) A modern cafe with a great atmosphere, stunning view and nice cocktails on the edge of the village. The quickest way to get to Nisyros from Athens is by flying to Kos and then getting a boat from the port of Kardamena (10 minutes from Kos airport). At least two boats leave for Nisyros per day. Round-trip flights to Kos cost on average about 100 euros (prices may be higher during high season). By boat from Piraeus the journey takes about 13 hours, with return tickets costing 40 euros in July. 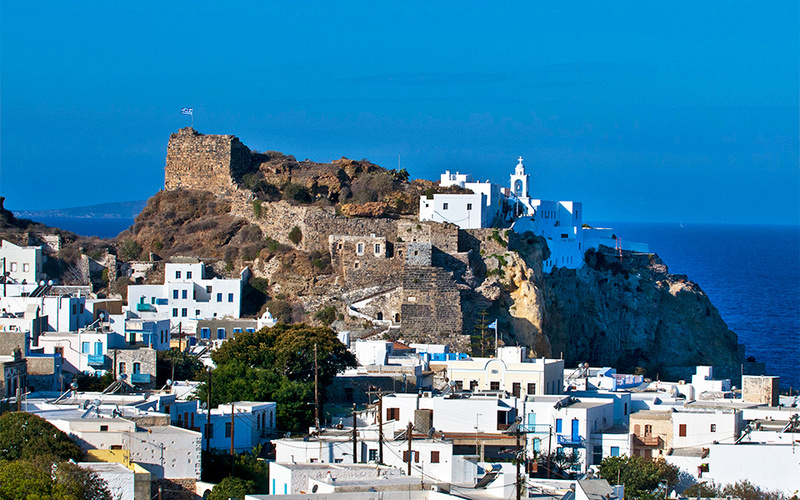 Nisyros can also be reached from the ports of Astypalaia, Halki, Kalymnos, Kastelorizo, Leipsoi, Leros, Naxos, Paros, Patmos, Rhodes, Symi and Tilos.